Although A Closed World, the free online game made by the Singapore-MIT GAMBIT Game Lab that aims to explore queer issues within the confines of an RPG-like environment, has been out for a few months now, I avoided playing it until earlier this week. Mind you, I didn't intentionally ignore it. I remember reading about its release with more than a little interest, but for some reason I can't recall at the moment it fell off my radar before I got around to playing it. How'd it get back onto my radar? While chatting with the Gayme Bar guys last week, one of them brought up the game as a good example of how the medium can address and otherwise tackle LGBT issues. Feeling like an idiot for not having played it, I vowed to do so the very next day. That I did--and then some, as I played through the game three or four times over the course of about an hour (mainly so I could see how things differ when you choose to play as a male or female). On the plus side: The game's graphics, especially those found in its turn-based, rock-paper-scissors battle scenes, are quite pretty. Its soundtrack is similarly appealing. I don't want to say much more than that right now, as I'm currently in the middle of writing a "somewhat gay review" for this game (expect it to be published sometime in the next week or two) and I'd rather save most of the pro-versus-con discussion for that post. 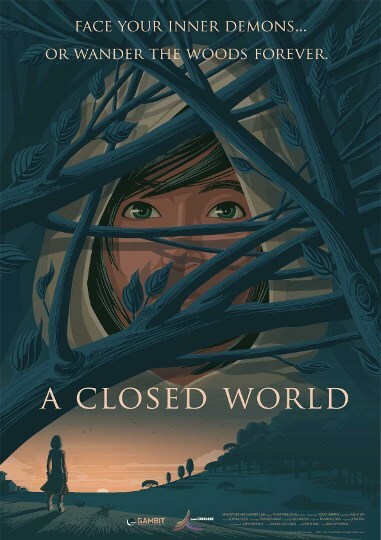 In the meantime, I highly recommend giving A Closed World a go--whether you're a member of the LGBT community or not. Yes, it's flawed in many ways, but for the most part I think it's admirably so. Also, it's sure to prompt you to consider how future games should tackle these same issues. For that reason alone, I think playing through A Closed World once or even twice is well worth anyone's time. I'm gonna do that tomorrow on my day off while putting off tackling the last dungeon in Skyward Sword...which is less than appealing to me for some reason. Ah, that's great, Justin! I'd love to hear your thoughts the game after you play it (A Closed World). As for Skyward Sword: What's your overall opinion of the game at this point? Have you enjoyed it, hated it, etc.? Oh wow, this is a game I might just consider playing if L (Next Save Point) brought it home! *hint hint* Afterall, I only got into Fable because it gave me the ability to be gay! I have some good news for you, The Sacred Femme: This is an online game, and it's free! There's some bad news to go with that, though. This game is very short. Still, you should try it. Just click on the link at the end of this post. Let me know what you think of it afterward, will you? Hey, thanks for sharing this. I just got through playing it. I really like the concept and presentation - I kind of wish more RPGs would start off simple and have this feeling of mystery. I totally agree with your comments. I can't complain because it's short and free, but I couldn't remember what-beats-what, so I sort of just button mashed - Passion, Passion, Breathe, Breathe. Also, it was bugging me what the theme song was, and then I realized it's a very similar to a track in Lost Odyssey! Oh, I've LOVED Skyward Sword. There are a few things about it that make me shake my head and say to Nintendo, "STOP DOING THAT!" but for the most part, it's absolutely amazing. Oh, and there's a comma error in the opening of A Closed World. Unattractive. Ah, I'm glad I helped make you aware of this, Darwin! I thought I was the last gaymer on earth to play it, but I guess not. I agree with you about the game's simple, mysterious beginning, by the way. It leaves you wondering what's going on, doesn't it? And serves to kind of prod you along, since you want to figure out what's happening, etc. I also quite liked the cut scenes that were interspersed between each "boss." I thought they were quite effective -- and beautiful. As for button-mashing during the battle scenes: That pretty much describes my experience, too. It's too bad, because I really liked the premise of them -- having to calm yourself down by breathing, using passion to combat logic, etc. -- but in the end it seemed kind of broken to me, and battles ended up being about mashing a particular button until it stopped working. That's a great find RE: the Lost Odyssey track, by the way! They're certainly quite similar, especially in tone. Oh, that's good to hear, Justin! I was worried that you were hating it. That said, I still don't know if I'll get it or not. There are too many games I'm going to need to get for my new 3DS between Christmas and Easter, I think, plus there's Rhythm Heaven Fever and Xenoblade for Wii. BTW, did you know Amazon is suggesting that Rhythm Heaven Fever will cost just $29.99? Man, I hope that ends up being true! I'd pay $30 for it! That would be awesome! And other than the comma error, A Closed World is kind of a neat experiment with a different way of playing games...something that could grow into a good thing eventually. Yeah, $30 would be an awesome price for me. I was fully expecting to pay $50 for it, so this is amazing! As for A Closed World: I agree! I have a number of issues with it, but considering it's a first effort that took just eight weeks to make, it's actually pretty good. I look forward to seeing what their follow-up is like.